Ozhotels is a group of independently owned and non-related hotels, motels, resorts and serviced apartments located across the Gold Coast, Australia. Oz hotels allows you to deal directly with these hotels and apartments giving you the best possible rates for this Gold Coast accommodation. Book online directly at these Surfers Paradise, Broadbeach, Southport and Mermaid Beach hotels and apartments and save save save!!! The Queensland Gold Coast has long been regarded as Australia's premier holiday destination and over many decades it has become a thriving entertainment capital that every year hosts millions of international tourists, families on holidays, sporting groups and couples who are looking for a romantic weekend away. The Gold Coast has something for everyone with a wide range of luxury and budget priced apartment accommodation available, plenty of fabulous shopping, exciting nightlife entertainment every night of the week, great weather, fabulous beaches and many interesting things to see and do. There are thousands of different accommodation options available for you on the Gold Coast and because of this it is easy and less time consuming of you use the free services of an accommodation expert like OzHotels to find the exact property for your specific needs. At Not1Night you can book your travel up to 12 months in advance and also have the added benefit of getting a discount off the already cheap rates the longer that you holiday on the Gold Coast. 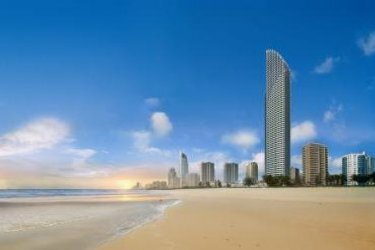 Surfers Paradise is the unofficial capital of the Gold Coast and is by far the most popular holiday destination for travellers from overseas and within Australia. This tourist mecca provides holiday makers with memorable holiday experiences because of its endless sandy beaches, contemporary entertainment and typical Australian beach culture. Around the main streets in Surfers Paradise you will find a very busy night life, theatre restaurants, award-winning tour operators, designer boutiques and a wide variety of dining options. The golden sands of Surfers Paradise patrolled beach are extremely popular and along the beach front every Wednesday and Friday evening there is a Beachfront Market with over 120 market stalls selling all sorts of goodies. There are just so many things to see and do when you stay in Surfers Paradise including visiting Sea World, Dreamworld, Movie World & Currumbin Wildlife Sanctuary, taking a cruise on the river and many other water based activities. Tourists should also visit QDeck at the top of the Q1 building, where there is an observation deck giving you spectacular 360 degree views of the rainforest, surf, beach and ocean. 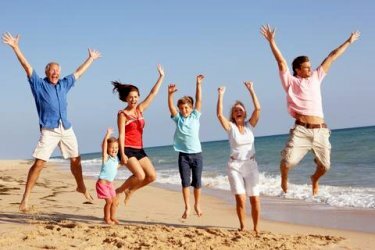 Combine these activities with Gold Coast accommodation that ranges from cheap hotels right through to luxury family apartments and you have the ideal place for a memorable holiday experience. Broadbeach is the second most popular holiday spot on the Gold Coast. This is because it features a number of fine dining restaurants, trendy sidewalk cafes and excellent shopping in either the local boutiques or the Pacific Fair Shopping Centre (which is the largest on the Gold Coast). In fact the cobbled streets at the Pacific Fair boast over 260 retail outlets including Myer and a major cinema complex. 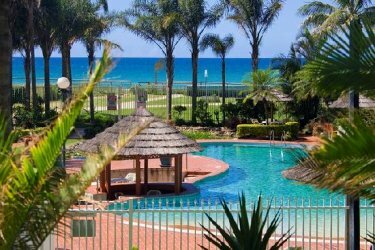 Broadbeach is family friendly location that has a wide range of Gold Coast accommodation options that will suit the budget of all sorts of travellers. It's central location means that nothing on the Gold Coast is very far away. Although when you stay in Broadbeach you can very easily get by without a car because everything that you need is within easy walking distance. Broadbeach boasts a number of the Gold Coast's major attractions including the mono-rail from the Broadbeach Mall to Jupiter's Casino, the Gold Coast Convention and Exhibition Centre and Pacific Fair. Add to this the magnificent Kurrawa beach with its great surf and safe swimming, alfresco restaurants serving great food and numerous wine bars then you have a place to stay that truly has something for everyone. 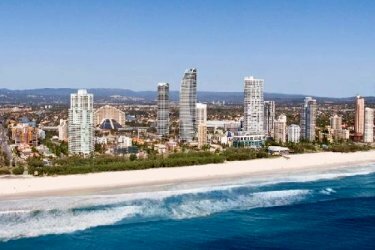 Situated just north of Surfers Paradise the Gold Coast area of Main Beach is an extremely popular holiday destination for couples, groups and families. It is the centre of the action when Indy car comes to the Gold Coast and boasts the famous Main Beach which is patrolled all year round and allows holiday makers to feel the soft sand between their toes which soaking up the famous Queensland sun. Main Beach is the ideal place for a relaxing holiday with the trendy cafes and restaurants of Tedder Avenue offering superb cuisines located close by. Also the Sea World marine park and the nightly entertainment of central Surfers Paradise are just a short stroll away from Main Beach. Staying at any Gold Coast accommodation in Main Beach means that you can hit the surf first thing in the morning and then spend the day cruising along the Broadwater or Nerang River. You may also want to take a nature walk in MacIntosh Park or along the beach foreshore to Surfer Paradise beach in the south or the Spit to the north. The seaside city of Coolangatta features beautiful beaches & lush parklands, encapsulating all that is beautiful about Australian beach life. Coolangatta provides a relaxing lifestyle that allows you to unwind and still discover all of the wonderful things that the Gold Coast has on offer. It is situated at the southern end of Gold Coast, only 5kms from the Gold Coast Airport at Bilinga and 25kms from the bright lights of Surfers Paradise. There are a number of beaches where travellers can swim, surf or just relax, including the north-facing Coolangatta Beach, Kirra and Greenmount beaches, which boast some of the best surfing on the Gold Coast. There are also endless activities for you and your family including visiting world heritage national parks, exploring the boutique shops, dining out at an alfresco cafe or restaurant or making the most of the nightlife. Many people who stay in Coolangatta appreciate the uncrowded beaches and relaxed nature of the area, as well as Tweed Heads across the NSW border. Whether it is walking along the picturesque Marine Parade or buying a holiday trinket at the Coolangatta beachfront Market, on the second Sunday of every month, holiday makers just love to come back to Coolangatta again and again. The little talked about holiday destination of Mermaid Beach is ideally nestled between the shopping mecca of Broadbeach and the prominent Burleigh Heads. This central location means that you have everything at your fingertips, including Jupiters Casino, the Gold Coast Convention Centre and the Pacific Fair Shopping Centre which are just 10-15 minutes walk away, Surfers Paradise which is just a short drive away and easy access to the Gold Coast Theme Parks. Mermaid Beach is set in a tranquil beachside location and features a white sandy beach and rolling surf that is patrolled by professional lifeguards. Also situated close to Mermaid Beach are a number of international restaurants, cosmopolitan cafes, exciting nightlife entertainment and excellent shopping. 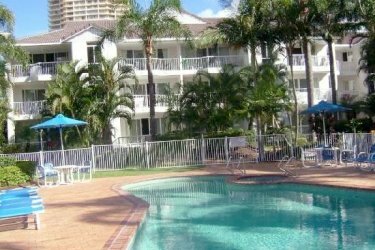 So to be close to all of the action of the Gold Coast, but still retain a quiet, peaceful holiday experience stay in one of the many accommodation options that are available in Mermaid Beach. Palm Beach is positioned just 7 minutes from the Coolangatta Airport and 20 minutes south of Surfers Paradise. Many people believe that Palm Beach is the perfect place for a relaxing holiday because it is more relaxed that the rest of the Gold Coast, as well as featuring beautiful sandy shores, first class golf courses and the still waters of the Currumbin River Estuary, where you can take the kids fishing. Some of the many other things that you can do when staying at Palm Beach on the Gold Coast is to play a game of beach cricket, stroll along the beach to Burleigh Heads, surf in the pacific ocean, swim at Tallebudgera Creek or visit Fleays Fauna Park & the famous Currumbin Wildlife Bird Sanctuary. The Palm Beach itself is patrolled by surf lifeguards every day during school holidays and on weekends. Gold Coast's Miami Beach is located just a short 10 minute drive south of Surfers Paradise and only 4kms from the Gold Coast Convention Centre, Jupiters Casino and the Pacific Fair Shopping Centre. The area surrounding Miami Beach features 2 wonderful, patrolled beaches, Nobby Beach to the north and the Burleigh Beach to the south. 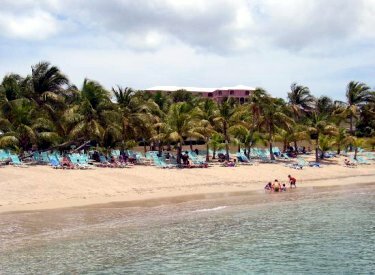 These means that holiday makers have a choice on where they would like to spend there days in the sun, and both beaches have picnic and barbeque facilities along the beachfront. There is just so much to do when you stay at Miami Beach. You can make use of the great recreation facilities such as golf courses, tennis courts, sports ovals, a swimming pool and bicycle track along the Esplanade, or you can stroll down to the delightful cafes, quality restaurants and boutique shopping that surrounds the area. Another popular thing to do when you stay at this Gold Coast holiday destination is to go for a short 20 minute walk up Miami Hill and admire the wonderful views of the coast line right along the Gold Coast. The heart of the CBD area on the Gold Coast is Southport, which is ideally situated just a short distance to the north of Surfers Paradise. Southport faces the Gold Coast Broadwater, which on the other side features the famous Sea World marine park with its numerous rides, marine animal shows and other attractions. Staying in Southport also means that holiday makers are within easy reach of the other theme parks on the Gold Coast, Dreamworld, Movie World and Wet'n'Wild. In and around Southport travellers will find an array of things to see and do, including shopping at the Australia Fair shopping centre, dining in the many fine restaurants, going to the cinema, fishing from the jetties or wandering through the Broadwater Parkland and enjoying the sandy beaches and barbeque facilities that are there. Another great thing to do when you stay in Southport is to experience the Surfers Riverwalk, which is an enjoyable 9 kilometre long walk that starts at Sundale Bridge in Southport and goes all the walk to the Pacific Fair at Broadbeach. Burleigh Heads is ideally located in the middle of the Gold Coast, halfway between Coolangatta and Surfers Paradise. 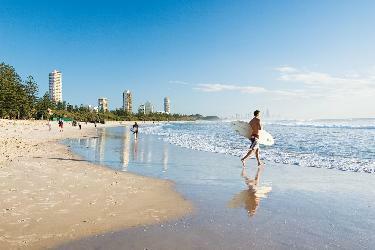 This central location means that it is close to everything that the Gold Coast has to offer tourists. At Burleigh Heads you will find that the beautiful, patrolled Burleigh Beach & National Park are within easy walking distance to all of the accommodation that is available. The foreshore in Burleigh Heads is a picture of beauty with golden sands, sparkling waters, BBQ areas, children's playgrounds and parks lined with Norfolk Pines. The waters around the headland at Burleigh Heads also provide for some truly amazing surfing, with keen surfers coming from around the globe to make the most of the famous "Burleigh Barrel". 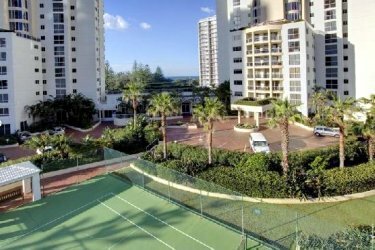 Couples and families who stay in Burleigh Heads are able to enjoy all of the recreational activities that are nearby including tennis courts, a bowling alley, lawn bowls, surfing, swimming and much more. There is also a craft market help along the beach front on the last Sunday of each month, where you you can find some great souvenirs of your holiday on the Gold Coast. The popular holiday destination of the Gold Coast, Surfers paradise and the surrounding regions have lots of different places that are ideal for long or short term holidays. This includes the Surfers Paradise Quarterdeck Apartments, Candlelight Holiday Apartments, Aloha Apartments Surfers Paradise, At the Sands Holiday Apartments, Surf Regency Hotel, Surfers Hawaiian Prestige Apartments, ANA Hotel Gold Coast, Surfers Paradise Resort, Surfers Paradise Marriott Resort, Hotel Watermark, Royal Pines Resort, Conrad Jupiters Hotel Broadbeach, Sofitel Gold Coast Hotel, Boulevard Towers Hotel Broadbeach, Palazzo Versace Hotel, Sea World Nara Resort, Crown Towers Resort, Blue C Apartments Coolangatta, Mermaid Cove Resort Accommodation, Magic Mountain Resort, South Tweed Motor Inn, Sandcastles on the Broadwater and the Hyatt Regency Sanctuary Cove. In order to book in at these or any of the other apartment accommodation on the Gold Coast or Surfers Paradise then click here to make an enquiry.